2015 Thumper won the Hawaii Shred Skate Parks Competition. In 2012 Thumper moved back to Hawaii. 2010 Thumper came in 5th in The Moscow Invitational on vert. Featured in rollerblading film Barely Dead. Story in Transition Magazine cover and full length story. Featured on Ballistic TV: Woodward East Segment, Gravity Games Segment, Cincinnati Segment. aaaaaaplus foreign networks around the globe. Featured Celebrity in “10 Years Later” movie premiere with clips in the opening Ballstic TV Movie special. Outdoor Life Network (OLN), and networks in Austrailia, and the Extreme Channel in the UK. Commercial for the YOU-MESSE, Europe’s biggest youth sports expo and featured interview for the event. European Challenge, Berlin Germany 3rd Place (highest placing American) held at the YOU-MESSE the biggest European sports expo. Mobile Skatepark Series (MSS) Pro Tour Cincinnati, 4th Place. Cover of the Mobile Skatepark Series (MSS) Holiday Card. “Got Milk” Demos at the LA Country Fair to promote tobacco-free kids. doing demos, hanging out and skating with campers. Camp Woodward has 10,000 campers per summer. Picture in Woodward West brochure. Article in Hawaiian Airline’s in-flight magazine, called Hana Hou. Over 1 million people read Hana Hou Magzine. *Meets up to 3,000 athletes per summer at Camps Woodward East and West, the top rated extreme sports training/camp facilities in the world. 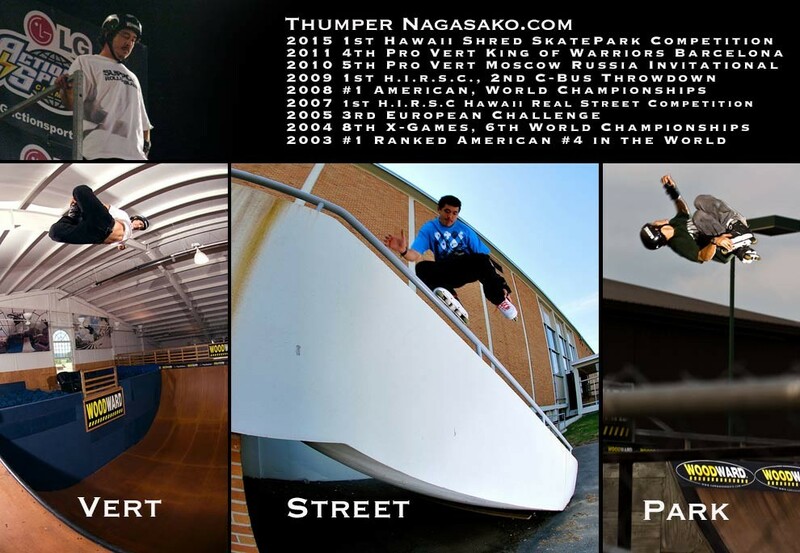 Athletes come from all over the world to train in gymnastics, in-line, BMX, and skateboarding. Thumper trains and teaches there about 6 weeks each summer. *Owns, operates and promotes: highrollaz.org, an on-line community dedicated to uniting vert skaters. *Owns, “HI-Focused Productions,”featuring custom videography and editing. *Co-Owner of“Wild Alaskan Salmon.” Imports frozen wild salmon for wholesale and retail sales. To be an ambassador for Hawaii in national and international contests; to proudly represent his corporate sponsors. To continue to push his limits as an athlete and to be a spokesman and role model for his sport. KITV NEWS About Thumper going to X-Games Qualifier statewide. Venice Beach X-Games Qualifier televised on Fox Sports Net. KITV NEWS about Thumper’s results a X-Games Qualifier. LG World Championships on Fox Sports Net, Fuel TV, and Extreme channel. Cover LG World Championships Program w/bio.